Photo by: LandPKS. Screenshots of videos that help walk a user through how to hand texture the soil in the SoilInfo Module of the LandPKS app. The LandPKS app (landpotential.org) helps users make more sustainable land management decisions by assisting users to collect geo-located data about their soils, vegetation and site characteristics; and returning back to users useful results and information about their site. The LandPKS app is a global app that can be used in any location around the world. As visible on the LandPKS Data Portal (landpotential.org/data-portal/), there have been LandPKS sites completed on 6 continents! 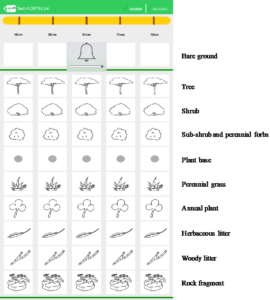 Selection of vegetation and cover types in the LandCover module of the LandPKS app. Users choose from these simple images to determine what types of vegetation are present at their site.